While Roman helmets typically all featured a similar style and shape, that was not always true for all Roman helmets. Take, for example, this Roman Horn Helmet, whose tall crown and reinforced cap helps it stand apart from typical Roman helmets. Unlike traditional Roman helmets, this one differs in design, almost radically from what was considered to be the standard norm. 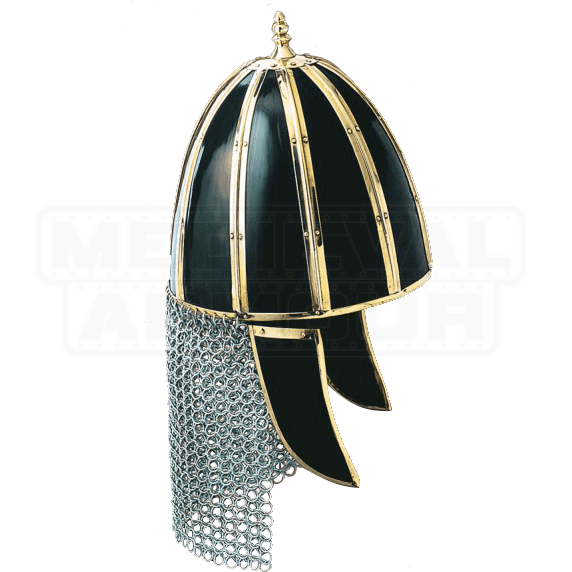 This helmet features a taller crown that is studded with a finial spike for decoration. The taller crown also helps to divert blows down the sides of the helm. The helmet is primarily black and features elegant, polished brass reinforcements along each panel of the helmet, which accents its appearance and enhances its strength. Two small flaps hang down from the sides to offer some protection to the sides of the face, while a chainmail cowl hangs from the back to protect the neck. This impressive helmet is made from quality materials to ensure the best helmet possible. 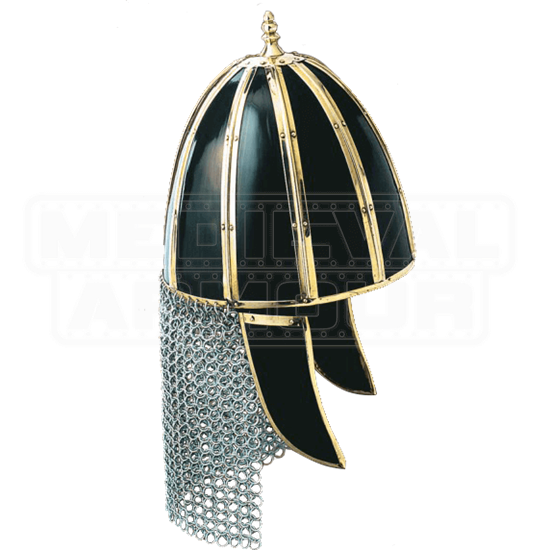 Of course, the upside to this Roman Horn Helmet is that it does not obscure your vision or hinder your movement much, and sometimes in battle, those are two qualities that any warrior would need.